A Weave fabric is a collection of Weave-enabled resources. It provides a convenient way for Weave nodes in a user's home to exchange messages in a secure way. The fabric is provisioned by the first node in the Weave system. 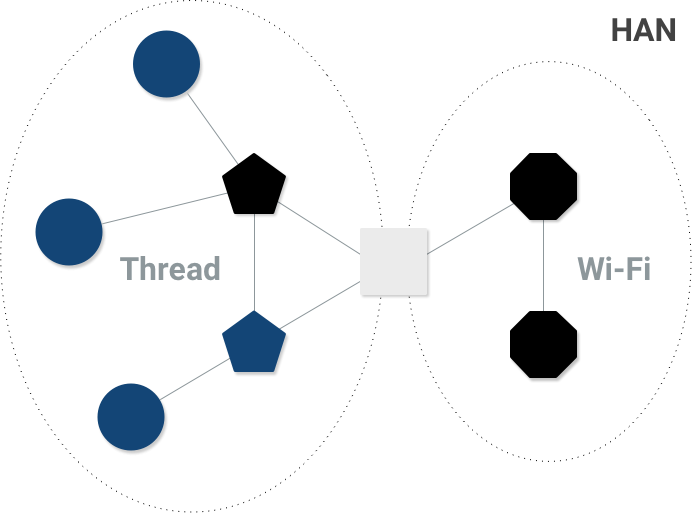 Once provisioned, other nodes can securely join the fabric using Weave certificates. We'll get more into certificates and security later, but remember, device pairing and fabric joining in Weave is always secure. Each resource in the fabric is assigned a special IPv6 address for use by the Weave application. It doesn't matter what routable wireless technology you use. 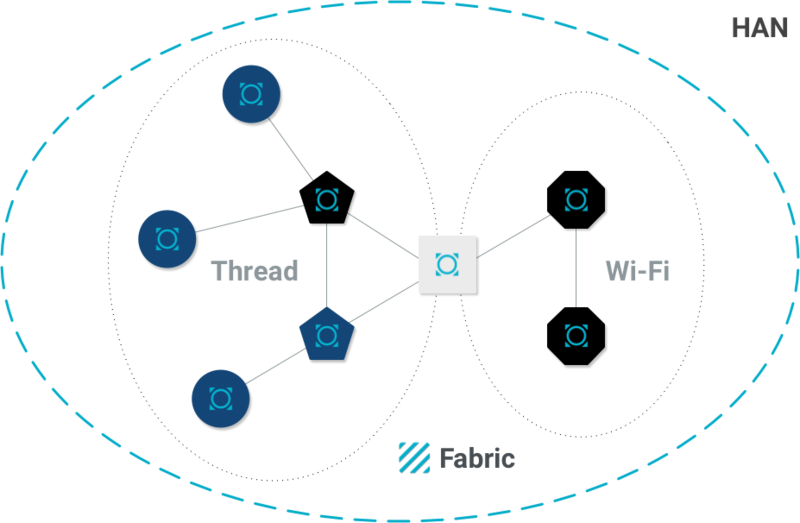 Ethernet, Wi-Fi, or Thread—as long as each node is running Weave and is a member of the fabric, messages may be sent and received. Suppose you have a simple Home Area Network (HAN) that consists of resources connected by both Wi-Fi and Thread. These two networks are joined together by a border router, which participates in both networks and acts as a router to route traffic between them. The resources in each network use their standard IP routing configurations to talk to each other through transport protocols such as UDP or TCP, but with a Weave fabric provisioned, they can now pass Weave messages over those same transports. A Weave fabric enables simple IPv6 routing across Weave applications by assigning a Unique Local Address (ULA) settings_input_antenna to each resource in the fabric. The Weave application uses this address to route Weave messages. Let's go through the different elements that make up the address. All Weave nodes use an IPv6 global prefix of fd00::/48. Addresses in this block are designated by the IETF in RFC-4193 for use within private networks such as a HAN. The fabric is assigned a randomly generated, unique 64-bit ID during fabric provisioning. This ID becomes part of the IPv6 global prefix. Each node in the fabric assigns itself a Weave Node ID, which takes the form of an IEEE Extended Unique Identifier (EUI-64). Most nodes derive their Node ID from their MAC address. A node may have a 48-bit or 64-bit MAC address, usually associated with their WiFi or 802.15.4 interfaces, respectively. Weave prefers to use the 64-bit value as the Node ID, when available. If a node only has a 48-bit MAC address, per RFC 4291, Weave inserts the 16-bit value of FF:FE in the middle to create the EUI-64 value, which is used as the Weave Node ID. For example, if the node's MAC address is the 48-bit 3c:36:13:33:73:2e, the resulting Weave Node ID is 3c3613fffe33732e. To use the Node ID in an IPv6 address, you must transform it into an Interface Identifier by flipping the seventh bit, called the universal/local bit. Thus a Node ID of 3c3613fffe33732e becomes an Interface Identifier of 3e3613fffe33732e. The last piece of the Weave IPv6 address is the subnet, a 16-bit value used to identify network interfaces. These values are determined by the underlying networks. For example, Wi-Fi or Thread. For this example, let's say our subnet is 0x0002. 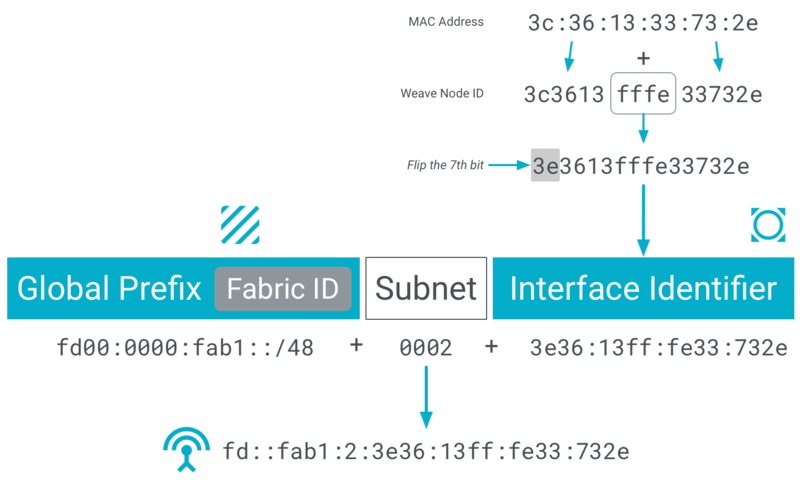 With an resource joined to the fabric, Weave profiles can now pass messages between it and other resources in the fabric via the node's Weave-assigned IPv6 address. Next we'll look at the basics of messaging in Weave.